Per Kristian and Bikash doing do lab work under Professor Kirk Shung at the Resource Center for Medical Ultrasonic Transducer Technology. USN professor Lars Hoff (nr. 2 from left) is their supervisor. Per Kristian and Bikash are doing parts of their Master’s Thesis in Micro and Nano Systems Technology in California - the world’s leading research community. 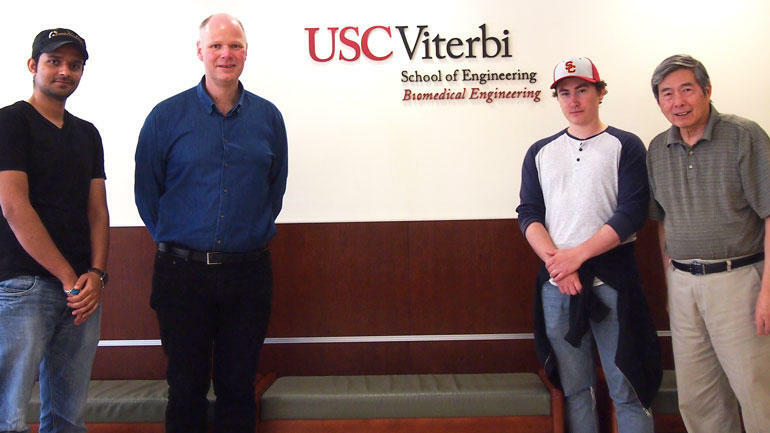 Two HSN students, Per Kristian Bolstad and Bikash Chaudhary, are on exchange at the University of Southern California (USC) as part of their thesis work within the Micro and Nano Master’s Degree programme. The two are there to do lab work under Professor Kirk Shung at the Resource Center for Medical Ultrasonic Transducer Technology. They are building ultrasound tranducers for high frequencies (20 MHz), which is based on a design created by Per Kristian and Bikash at USN, campus Vestfold. Per Kristian and Bikash took some time to explain how their exchange program is going. “It’s been a unique experience going on exchange to the University of Southern California. Even if it’s busy, it’s exciting to do research with great minds in a state of the art laboratory. We spend most days working on our thesis. When we need a break, we relax in the sun or go sightseeing and shopping in Los Angeles,” says Per Kristian Bolstad to usn.no. “Inducers like these are used as medical diagnostics in capturing small structures where we want high resolution images. Important applications are the examination of the eye and the skin. It’s also used on catheters inside the blood vessels for measurement of the blood flow and examination of the walls in the blood vessels,” says their mentor Professor Lars Hoff at USNs Department of microsystems. Professor Hoff is thankful for the Norwegian Center for International Cooperation in Education for funding the project and giving students and Hoff the opportunity to work with such an internationally recognized research institution in California. “Ultrasound technology is very important to our region. We have world-leading businesses in Horten who develop and use ultrasound technology in various industries. USN aims to educate students within ultrasound technology for the benefit of this industry” Hoff continues enthusiastically. GE Vingmed Ultrasound. Medical diagnostics with a special focus imagery of heart and blood vessels. Kongsberg Maritime. Sonar and sounder for imagery and research at sea. Medistim AS. Researching blood vessels during surgery. FFI, Karljohansvern. Detection and communication below water. Did you know that USN is one of the leading research communities within micro and nano technology in Norway? The University College is part of the Norwegian Centre of Expertice (NCE) Micro- and Nanotechnology in Horten. Norway currently has 14 strong NCE clusters, each with a focus on a specific field and market. From these NCEs, businesses emerge to take leadership positions in the global market. This cluster is focused on micro and nano systems technology and has a community of almost 30 research groups and businesses in the Horten region that develop and produce micro and nano technology.